Choosing the army over jail, career criminal Lou Drumm was mauled by a shark at ground zero when an experimental bomb was detonated. 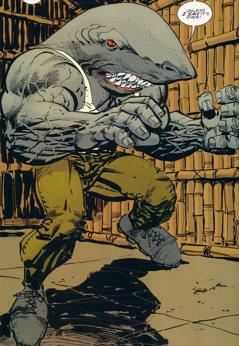 Instead of dying, Lou was mutated by the radiation so that he took on the appearance and abilities of a shark. He moved to Chicago where the freak population was highest in the United States and under the moniker of Mako, soon joined up as a member of the Vicious Circle. Mako soon became quite ambitious within the criminal organization and formed a close alliance with HellRazor and Basher. This trio encountered the veteran hero SuperPatriot during one heist that resulted in the hero suffering severe damage to his limbs and face. Mako then consumed portions of their victim, leaving him in need of cybernetic enhancements in order to regain mobility. The trio then came to the attention of OverLord who would suffer no potential rivals and so he arranged for the new SuperPatriot to eliminate them all, along with Dragon. Only Basher was killed but the rest all ended up in hospital before Mako and HellRazor were incarcerated at Stronghold Penitentiary. A massive breakout occurred at the prison and Mako was one of many villains that escaped. He joined up as a member of the Covenant of the Sword which led to a rematch between him and SuperPatriot. The hero was backed up by his teammates in Freak Force this time and they fended off Mako and his superhuman companions. Mako remained distant from the Vicious Circle during the rest of OverLord’s reign but re-emerged during the Gang War. He brutally beat an already crippled and disfigured Dragon until Freak Force came to their ally’s rescue. Mako once more found himself locked up in Stronghold but when CyberFace orchestrated another breakout, the villain returned to the streets once more. When Horde had taken control of the Vicious Circle through the use of his leeches, Mako was one of those enslaved. He was dispatched along with a group of fellow freaks to eliminate CyberFace and his rebel faction. PowerHouse removed the leech from his friend’s neck and they forced Dragon to confront Horde on their behalf, holding Alex Wilde as their hostage. Some time later, Mako’s knowledge on the Covenant of the Sword was utilized so that PowerHouse could provide intelligence to Dragon for a raid on the group. They had abducted Negate and Baby Boom from the Vicious Circle, along with several super-powered children and heroes, and a rescue mission had been arranged. Negate and Baby Boom were combined into the second Nega-Bomb that was detonated, ridding the Earth of most super-powered individuals. Mako was enraged by this assault and accompanied a number of heroes in liberating the Covenant’s prisoners. After Dragon has moved from one reality to another, Mako’s life had taken a rather large turn during the initial Stronghold breakout. He had witnessed Dart about to be raped at the hands of Wreckage and memories of his sister suffering a similar fate rushed back. Mako bit off the head of Wreckage which caused his Vicious Circle colleagues to turn on him. Mako raced away with the injured Dart and transported her to safety, a deserted island in the Coral Sea. The pair lived on this island for some time as Mako recovered from his injuries. The villain enjoyed this existence so much that he ended up lying to Dart about the scale of various alien invasions, informing her that humanity was dead. He soon won the heart of Dart and the couple became lovers, living away from the rest of the world in peace. When the Atlantean began using the Grokk monsters to dig tunnels that linked every large body of water around the world with one another, Mako learned that the Earth was becoming destabilized. He infiltrated Atlantean society and soon became a trusted ally of the king. Dragon ended up getting imprisoned in Atlantis and his former enemy aided in his escape before assassinating the Atlantean, thus saving the world. When Barbaric, Ricochet and Horridus washed up on their island, Mako’s lies were exposed and he was forced to admit to Dart that mankind still lived. He provided transport taken from Atlantis so that the group could return home. This quintet ended up forging a lose-knit team that would work together on missions that included rescuing Dragon from Dimension-X and fending off the minions of DarkLord that were attempting to bring their master over to this reality. Dart ended up falling out of love with Mako and started up a relationship with Justice, prompting her former lover to become fuelled with jealousy and rage. He abducted her, taking the heroine back to their former home in the Coral Sea. Dragon attempted a rescue but during the ensuing fight, Mako accidentally killed the woman he loved. Mako blamed Dragon for this death and abandoned humanity, fleeing into the ocean. Mako would return as the new ruler of Atlantis, leading his army on an invasion of the surface world. This attack took place during Mister Glum’s enslavement of humanity through the use of the God Gun. Mako soon became obedient to Glum and his army was massacred at the hands of Glum’s superhuman slaves. In the months that followed, Solar Man returned from the dead and began exterminating villains all over the world. Mako recognized Solar Man as a threat against him and all of his old allies and sought to unite the Vicious Circle to take the fight to the hero. He led an army of villains against the hero but he and LowBlow were the only survivors, the rest of their allies having been slaughtered at the hands of their intended target. Mako started to grow tired of his existence, lamenting the fact that his appearance had prevented him from living a normal life. When he heard that his elderly mother was dying in a medical center, Mako went to bid farewell to her. He caused devastation as he made his way towards the hospital and ended up fighting against Daredevil and the children of Dragon, Malcolm and Angel. This conflict ended up causing the hospital to collapse, killing everyone inside including Mako’s mother, preventing him from saying goodbye to her. When the Tyrrus Combine launched their global invasion upon Earth, millions of the aliens descended on the planet. Mako knew that the world was in trouble and opted to swim down to Atlantis in search of assistance from the undersea kingdom. King Garf refused to help as he was happy to allow the surface world’s population to be thinned by the aliens. Mako killed the monarch and instead seized control of the army and led the Atlanteans up to the surface with the Grokk sea monsters providing needed muscle. Mako is later seen being entertained by Dragon’s trial on TV. Later while watching Dragon being interviewed and being mocked by Frogman for not being able to put Dragon down, Mako “snaps” and begins a rampage. It takes the combined might of Flash Mercury, Powerhouse, Star, Red Giant, and Malcolm to finally knock him out. Mako is then sent to jail and is visited by Osgood who is upset by the fact that Dragon killed Urass. Osgood plans on setting up a meeting between Mako and Dragon so Mako can kill Dragon. Eventually Mako tracks Dragon down and the two get into a brutal brawl. Mako rips off both of Dragon’s arms and is about to deliver a killing blow, but is incapacitated by the guards at the prison via laser guns. Later Dart begins an attack on Stronghold Penitentiary in order to free members of the Vicious Circle. However, Dart kills him by slicing his head in half and finally overcomes her fear of Mako, due to him killing the original Dart who was also her aunt.